Earlier this evening I read a two year old blog post on Tenkara Talk about the Understanding Tenkara Level Lines. With some editing, I posted the following information there. Since it was a two year old blog post and might not be seen by people who do not understand the numbering system. I thought I'd post it here. The Japanese line numbering system numbers are multiples ( or ratios) of the Cross Sectional Area of the lines - referenced to the Cross Sectional Area of 1号 line. The Japanese line tables provide a list of lines in the order of the Index or Issue number ( 号数). The tables give the diameter of the lines in millimeters ( mm). Here is one such table from the Oni web site. Note the 号数 ( Gōsū or Gō Kazu) numbers in the left column. And the Line Diameter , 直径 ( Chokkei) , in mm in the center column. To understand the 号数 system you only have to understand that the numbers are the ratios of the cross sectional area of the lines in square mm, ( mm^2) referenced to the size of 1号 line. Not some multiple of the diameter of the line. When line is manufactured it is measured in Denier = X grams/9000m. 9000 m of line may sound like a lot of line, but it would only be 450 20m spools. Again 1号 is the reference Denier value. Denier value will vary from manufacturer to manufacturer. But here are Denier values from one company for their fluorocarbon line. Size 2号 line is 2x the weight of 1号 line. Size 4号 line is 4x the weight of 1号 line. Size 5号 line is 2x weight of 2.5号 line. Thinking of the line in terms of weight might be more useful if you want to make a hand tied tapered line and want to match the line weights for best balance. But my main purpose is just to give an insight to the numbering system. By CSA or Denier, which ever way you prefer to think of it, maybe now you understand what the numbers mean. iow : 4号 will be 4x the cross sectional area (CSA) as the CSA of 1号 line. CSA 1号 = pi x (.0825mm)^2 = .021382465 mm^2. Thus .021382465 mm^2 is the reference CSA for the other sizes of line. CSA 2号 = pi x (.1175)^2 = .043373614mm^2. CSA 3号 = .063793966 mm^2. And so on. It also works for smaller sized line. 5X tippet = .8号 = .148mm. CSA .8号 = .017203361 mm^2 . CSA .8号 / CSA 1号 = .80455. 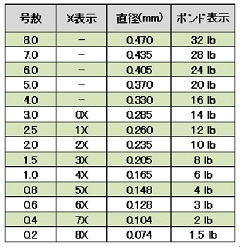 Hopes this helps you to understand the 号数 ( Issue Number) line sizing system. However, you will find variations. One post on TT stated the TUSA 4.5号 line has a diameter of .365 mm. CSA TUSA 4.5号/ CSA 1号 = 4.89348 . Which is closer to 5号 than to 4.5号. Apparently they are rounding down to 4.5号. I think you will find variations between manufacturers and how they decide to round the diameters to standard size numbers or due to manufacturing tolerances. Especially sizes other than 1号 line. To be consistent with the system 4.5号 would have a CSA of .0962211 mm^2 , and a diameter of .350 mm. Now you know where the numbers come from. If it matters to you.